Over 100 government leaders, academicians, donors, farmers and politicians meeting in the Borlaug Symposium, a senior-level gathering of global agricultural decision makers, held in Addis Ababa this past July, recommend that agricultural programs in Africa use linkage opportunities offered by livestock production alongside food crop farming to enhance the productivity and value addition of Africa’s agricultural sector. Among other recommendations, the Symposium calls for greater support to address the extension needs of pastoralists to help them develop and maintain their livestock-based systems saying that well-coordinated livestock and food crop production programs are essential if Africa is to achieve a ‘green revolution’ of its agricultural sector. Many households in Africa largely depend on mixed farming systems that grow crops and keep livestock to meet food and income needs. Livestock play an especially important role for Africa’s pastoralist populations, most of who are dealing with the effects of climate change while relying on livestock to sustain their livelihoods. Strengthening livestock development has a direct impact on many of these pastoralist households and other smallholder households in mixed farming systems. ‘Livestock is such an important source of income, actual and potential, for smallholders that we cannot ignore ways to improve the linkages between crops and livestock,’ said Christopher Dowswell, the Executive Director – Programs, of the Sasakawa Africa Association. The Sasakawa Africa Association is a Japan-founded group that seeks to apply green revolution principles to meet the changing needs of extension and the constraints to improving smallholder productivity in Africa. The association organized the Borlaug Symposium from 13-14 July in Ethiopia and brought together ministers of agriculture from 10 countries, academicians from African agricultural universities,representatives of bilateral donor agencies, private foundations, agribusinesses farmers and politicians. Carlos Seré the Director General of the International Livestock Research Institute (ILRI) attended this year's event. The Symposium also recommends efforts to address the challenge of smallholder’s access to commercial markets to enable them to profit from agriculture by, for example, organizing them into farmer organizations or as outgrowers to larger private agribusinesses specialized in export crops. ‘The value chain examples [shared in this symposium] illustrate that there is considerable scope for smallholder farmers to capture more of the total value added, after production, than they have before,’ said Dowswell. The meeting also highlighted the need to reach women farmers with productivity-enhancing technologies, and to incorporate them in appropriate research and extension programs while at the same time seeking to correct the disadvantaged position women in Africa face that restricts their access to land and other production resources. It also encourages greater stakeholder participation in mechanizing smallholder agriculture, agricultural education and for more economic investment in the agricultural sector. The Symposium was held to honour the life and achievements of Dr Norman E Borlaug, who died in September 2009 and was a co-founder of the Sasakawa Africa Association. It was attended by among others former US President Jimmy Carter who, with Dr Borlaug and Ryoichi Sasakawa, helped to establish the Sasakawa-Global 2000 program in 1985 to strengthen Africa’s agriculture. The symposium also launched the Sasakawa Fund for Extension Education in Africa and highlighted some key agricultural developments in the continent. You can read more about the Borlaug Symposium 2010 and its recommendations at: http://saa-borlaug-symposium.org/?page_id=54. The World Food Prize, known as the ‘Nobel for Food’ (no Nobel Prize exists for agricultural science), was created in 1986 by Norman Borlaug, who himself won the Nobel Peace Prize in 1970 for his work creating high-yielding crop varieties estimated to have saved more than 1 billion lives from famine. The World Food Prize honours those who improve the quality, quantity or availability of food in the world. 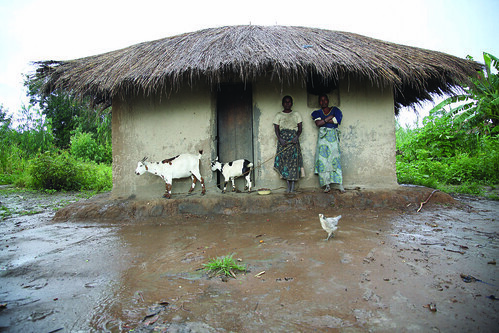 A co-winner of this year’s World Food Prize, announced on 16 June by US Secretary of State Hilary Rodham Clinton, is Jo Luck, president of the popular American charity Heifer International, which provides farm animals to needy families, who then ‘pass on’ the gift of subsequent offspring to others in need. Speaking in a seminar held in her honour at the Nairobi campus of the International Livestock Research Institute (ILRI), where she served as a member of ILRI’s Board of Trustees between 2002 and 2005, Jo Luck reflected on her life that was a preparation for the role she now plays. ‘All the time I was learning what has brought me to this road. My experiences as a teacher and as a parent taught me how to recognize both the strong and the weak and how to bring people together and empower them by listening and learning from them,’ she said. ‘I represent many people who are receiving this award through me and I hope to honour and represent them properly,’ she said. Those lucky enough to meet Jo Luck are struck immediately, and almost physically, by the depth of her energy and passion. Her ability to quickly tell a moving story that inspires people to make a difference in the world has more in common with, say, Oprah Winfrey (who has interviewed Jo Luck on her show) or Bill Clinton (who Jo Luck used to work for) than with other heads of charitable or development organizations. The results of much of Jo Luck’s life’s work can be seen in communities in the developing world. Since joining Heifer in 1992, she has vastly up-scaled Heifer’s programs, which provide food- and income-producing animals to poor families, and helped broaden Heifer’s agenda, which now includes improving livelihoods through education and community development as well as animal husbandry. With skilful management and superb communications abilities, Jo Luck built innovative educational initiatives that link grassroots donors in rich countries to recipients in developing countries. This not only brought new (and renewable) resources to poor farmers in developing countries but also gave Americans much better understanding of global hunger and poverty issues. 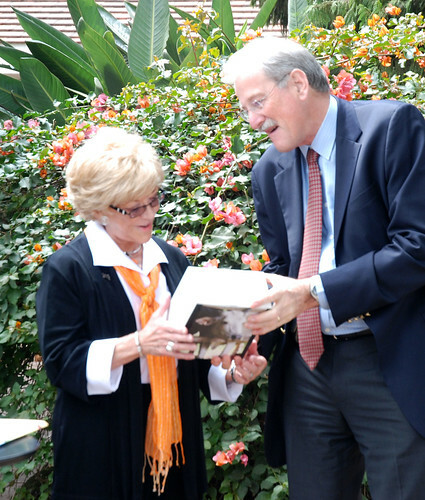 As a result of her efforts, both the scope and impact of Heifer International have grown throughout Africa, the Americas, Asia, the South Pacific and Central and Eastern Europe. At least 10 million families, including 1.5 million families in 2009 alone, have been helped both to put nutritious food on their own tables and to feed others. Jo Luck has worked with ILRI and other groups to bring about closer collaboration between experts and local communities. Such collaboration, for example, is at the heart of a Heifer-run East African Dairy Development Project being conducted in Kenya, Rwanda and Uganda. ILRI works with Heifer on this project along with TechnoServe, ABS-TCM and World Agroforestry Centre (ICRAF). ILRI researchers are providing technical advice on such matters as improved breeding and feeding and are monitoring and evaluating the project as it goes along. This project, which is creating dairy ‘hubs’ in the three countries, is helping 180,000 households to participate in, and profit from, a booming dairy industry in East Africa. By joining forces, the partners in this project aim to help one million people, mostly poor rural farmers, double their incomes in the next few years. Jo Luck will receive the 2010 World Food Prize in Des Moines, Iowa, on 14 October this year. Both she and her co-winner, David Beckmann, President of Bread for the World, another American grassroots organization working to end world poverty and hunger, will make presentations at the event, as will ILRI Director General Carlos Seré and other leading heads of international development work. For more information about Jo Luck’s work with Heifer please read this related article. In the following two short video interviews, Jo Luck discusses 'how livestock catalyze community development' and 'delivering livestock research that makes a difference'. The World Food Prize website has further information about the Laureate Award Ceremony and Borlaug Symposium.